An email I received today notifies that my free trial is about to expire. 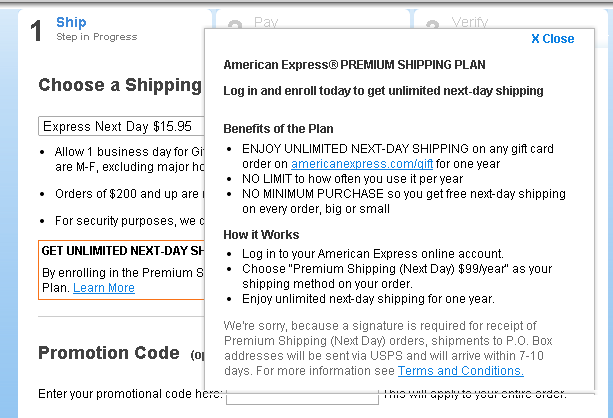 If I don’t cancel until the free trial ends, AmEx will charge $99 and process one-year enrollment. And they are going to send me $25 gift card as the thanks for an enrollment. So, it is like a $25-off deal on Premium Shipping Plan. Since I intended to keep using the Plan anyway, I was very happy with this offer… However, after some research on the internet, there WAS a much better deal. 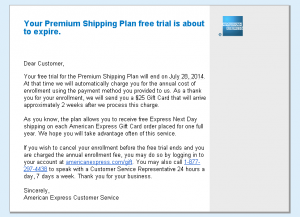 According to Frequent Miler blog, there was a promo code to waive the fee of Premium Shipping Plan completely. Unfortunately, this code expired last month. I might have found and gotten this offer if my free trial expired last month. What’s done is done. Now I have two options. One is to do nothing and let them charge $99 automatically, and then get $25 gift card. The other is to cancel Premium Shipping Plan and wait for a code to show up, which waives 100% of Premium Shipping Plan fee. If I take this option, I will lose the $25-off deal. Besides, nobody knows when the code shows up. Or nobody even knows if the code shows up again. 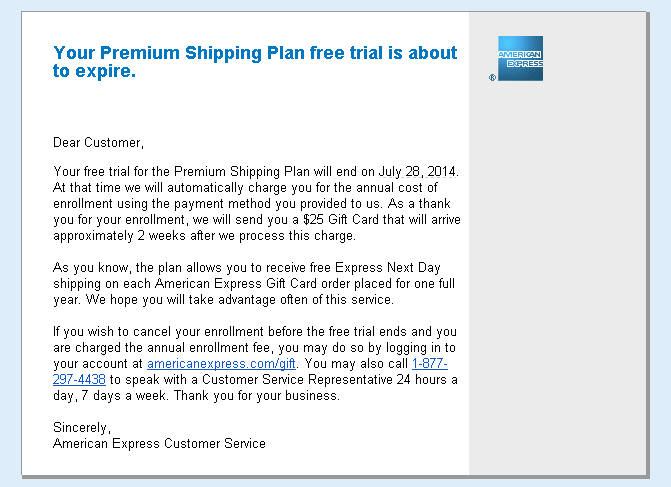 So, what I do is to pay attention to promotions for American Express Gift Card until my free trial expires. If the code shows up before it expires, I will cancel the Plan and then make a new enrollment with the code. Otherwise, I won’t do anything. 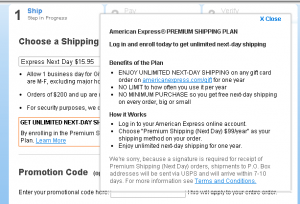 AmEx will charge $99 automatically and send me $25 gift card. I purchase AmEx GCs every week or two. I don’t want to risk losing $25-off deal for the code that is uncertain to show up. There are two weeks until my free trial expires. I hope the code will show up.